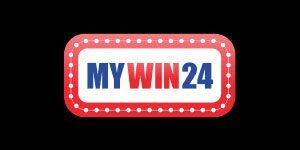 MyWin24 Casino will then reward you with a bonus (Welcome Bonus is for new players only). 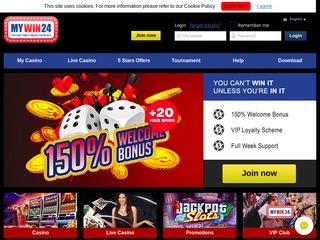 The terms and conditions of the bonuses vary between different casinos and might also change over time and between different countries, so it is important to compare the different offers and read the T&C for MyWin24 Casino before signing up. Proven fair by iTech Labs and licensed by Curacao, MyWin24 incites you to, “Play 24/7, win every minute!” There is no time to waste so let’s get on with the review! Right off the bat, we want to prepare you for a well-rounded game portfolio. At MyWin24 you will find an ample assortment of slots, table games and other card games, all of which are counted in hundreds. Furthermore, some lottery and arcade games have found a home at MyWin24 as well. The venue’s live casino section will blow your mind and wait until you see who has teamed up to supply the operator with their games. iGaming behemoths like Microgaming, NetEnt, Playtech, Mr. Slotty and Endorphina have given up masses of their titles for adoption to MyWin24 Casino. Conveniently, all of the games are rated, so you can see what your fellow players like to play most and what they make of the games. Whether it is branded, mythical, historical, fantastical, romantic or other slots that you are into, you can enjoy them at MyWin24. Every month brings a whole lot of fresh additions, all of which you can find under ‘New Games’. Some of the most popular slots include Robo Smash, Poltava and Treasures of Tombs. As you can see, MyWin24 Casino’s clients are mostly hipsters, and take pleasure in some unique and exclusive titles. The jackpot department is filled with multi-million titles like Mega Moolah, King Cashalot, Treasure Nile and many others. After all the spinning, we think it’s time for you to sit at the table and enjoy a relaxing game of Baccarat, Blackjack, Poker or Roulette. All of the hottest variations of the games are at hand as well, so you have a wide diapason of games to choose from. We are talking over 100 table games, so be ready to have a pick! What’s more, you will stumble upon some exclusive titles you will not see at many other online gaming venues. Video pokers are easy to find at MyWin24, as they all neatly sorted under their own category. No need to scroll endlessly through a collective card games section. At this online gaming establishment you can enjoy over 90 video poker games like Aces & Eights, All Aces, Bonus Poker, Deuces Wild, Jacks or Better, Joker Multitimes and Poker Pursuit. They are all available in single up to 100-hand modes. The wealth of the offering sees a litany of arcade games as well. Some of the titles you can enjoy at MyWin24 are Keno, Electro Bingo, 7 Piggies, Queen of Gold and dozens more! Hungry for some live action? Head straight to MyWin24 Casino’s live dealer section and gorge on the abundance of live games! The live lounge hosts about 40 live titles, all of which are dealt by professional croupiers, and in real time! Moreover, if you feel like it, you can even chat with your dealer! There are both male and female croupiers, and they are all attractive and pleasant to be around, we can promise you that. Some of the games you can revel in at MyWin24 Live Casino are Live Caribbean Stud Poker, Live Baccarat, Live Blackjack, Live Money Wheel and a plethora of Live Roulettes and other variants. MyWin24 does its best to keep up with the latest trends and its clients’ wishes and needs. That is why this online casino works with all major banking firms and enables you to use your preferred banking methods in its quarters. All major ewallets like Neteller, Skrill, Paysafe Card, QIWI and Trustly are available for deposits and withdrawals. In addition, you can utilise popular credit and debit cards such as Visa and MasterCard. Bank wire transfers, although the slowest to process your requests, are an option. You will also find some specific options you do not see at many online casinos like Multibanco, Neosurf, Entercash and PayVision. The overall pending time at MyWin24 Casino totals between 24 and 48 hours, and the upper withdrawal bar is set at an amazing 10,000 EUR per month! Other than numerous European and international currencies, at MyWin24 you can also pay with Bitcoin. Customer service team at MyWin24 is always ready to help your with your questions and concerns. They offer you a 24/7 Live Chat service where a helpful team rep is always online and happy to answer your questions. This is the quickest way to get in touch. If your issue can wait, then perhaps you would prefer to email the team. You can do so by filling out the online contact form on the website, by clicking on the ‘Messages’ button within the site’s header. An alternative is to send them a direct email to [email protected] Please bear in mind that this kind of communication may be intruded by a third party, so exclude any banking information. On the ‘Help’ page you will find a chunky list of answers to the most frequently asked questions.